Today I bring to you a product that I received in this month's Birchbox. It is a self-tanning towelette that works for face and body and claims to bring you streak free color in 3 hours. Here is the link to check it out on Birchbox. A few years ago I decided to get a mole removd that had been bothering me for some time, and biopsied. It ended up being non-cancerous, but I have a nice scar to show for it on the front of my chest that always reminds me to use SPF so I don't have to freak out about skin cancer! I spent a lot of time in tanning beds in high school and college, and I have a lot of moles on my body, so I am extra cautious these days about tanning smart. That said, I wanted these little towelettes to work. I have two, and wanted to use them one at a time. I asked my hubby to get my back and all the areas I couldn't reach with the towelette, then got the rest myself. I did my legs last, and admittedly once I got that far I was running on very little juice in this towelettes. But considering their price ($14.99 for an 8 pack) I didn't want to crack open another. It's not that they're expensive, I'd consider their price tag as being somewhere between high end and low end, but if you use one towelette per tanning session it's around $2, and if you need 2, it bumps the pricetag up to about $4 a tan. Can you tell I'm stingy with my money? I applied this before bed like I normally do, because I sleep with a fan on so I'm not sweating, and I sleep in loose clothes, so I'm not streaking the color. I was super worried how it would turn out because like I said, I was running out of juice towards the end. It was an okay product, but I definitely should have used two pads instead of one. It got a tad bit streaky around my arms but it didn't tan me so dark that the streaking was super noticeable. I got a very subtle tan with these but it did run out around my legs so those didn't pick up much, if any color. I would recommend these if you use two pads for your body and already have a bit of a tan built up underneath, so that streaking is less noticeable. Make sure and stay tuned for more reviews on sunless tanners coming right up! In the next several days I will be reviewing Dr. Dennis Gross Alpha Beta Glow Pads for Face, as well as St. Tropez Gradual Tanner, and Jergen's Natural Glow Daily Moisturizer. Thanks for reviewing a Birchbox product. 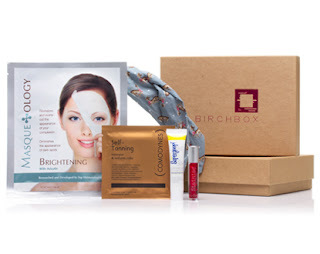 I love to see the different products you two get compared to my box, and if there's any products that I'm missing out on that might be worth using my Birchbox Points for.. I'll have $40 to spend in the Birchbox store after I get my next box so I think I'll be doing some shopping soon!